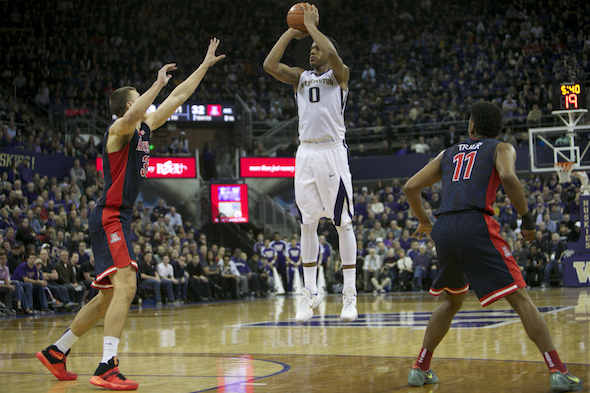 ESPN’s Chad Ford speculates that Washington stars Marquese Chriss and Dejounte Murray, along with Gonzaga’s Domantas Sabonis, will be among the top 10 picks in the NBA draft Thursday. The one and only Final Four appearances among Washington, Washington State, Seattle U., Oregon and Oregon State took place more than 50 years ago. The Northwest’s five other Division I programs – Gonzaga, Eastern Washington, Portland, Portland State and Idaho – have never played in a Final Four. None of this has prevented Northwest colleges from producing a long list of quality NBA players. The roll call includes Hall of Famers John Stockton (Gonzaga), Elgin Baylor (Seattle), Gary Payton (Oregon State), Gus Johnson (Idaho) and Bob Houbregs (Washington). Time will tell if another Hall of Famer from the Northwest emerges from the 2016 NBA draft. ESPN’s Chad Ford is not making any Hall of Fame forecasts just yet, but the respected NBA draft analysis predicts three of the top 10 picks Thursday (4 p.m., ESPN) will come from Northwest colleges. In his latest mock draft, released Saturday morning in the “insider” pay section of ESPN.com, Ford predicts Washington power forward Marquese Chriss will go fourth to Phoenix; Gonzaga power forward Domantas Sabonis will be taken ninth by Toronto, and Washington wing Dejounte Murray (whom Ford projects as a point guard in the NBA) is bound for Milwaukee as the No. 10 pick. Ford offered high praise for all three players. Ford predicts college forwards will be the top three picks. Ford figures Louisiana State’s Ben Simmons will go No. 1 to Philadelphia, Duke’s Brandon Ingram goes second to the Los Angeles Lakers and Boston grabs California’s Jaylen Brown with the No. 3 pick. Dint really disagree with Ford but I think the NW player who’s game is the most NBA ready is Payton. The other 3 are all potential. Fair point. Chriss is likely to be a reserve for two years until his body fills out, and he learns to play defense. And were I a GM I’d have a hard time spending the 4th pick of the draft on a project. IMO, if you don’t stand out quick in the NBA the league will peg you as nothing more than a reserve or role player for the rest of your career no matter how good you are, unless you get an opportunity and an extended period of time to play and take advantage of it. That’s why it’s better to stay in college at least three years depending on the player’s development.